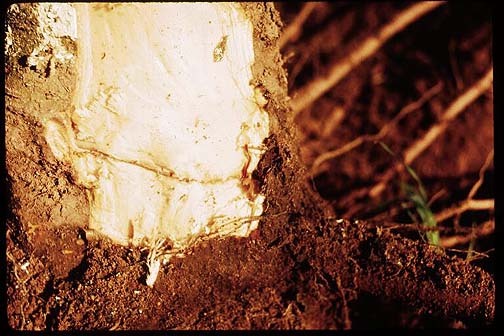 The bark has been removed from this Red Delicious apple tree to expose the graft union. Note the line of damaged tissue between the rootstock and scion. Cause Tomato ringspot virus is spread by dagger nematodes, Xiphinema americanum (sensu lato). The virus occurs in many areas of Eastern North America, and has been reported occasionally in the Pacific Northwest and California. The host range of the virus is wide including many fruit, ornamental, and vegetable crops as well as many weeds. Symptoms Signs of infection do not appear until the infected tree approaches fruit bearing age. At that time, the tree exhibits an unthrifty growth habit associated with an abnormally high fruit set. Symptoms may also include reddish coloration of the leaves and bark. In severe cases, a dark necrotic line will appear at the graft union flanked by spongy orange tissue. Cultural control Primary control is by planting virus-tested (and found to be free of all known viruses) trees and in sites that have no history of the disease. Disease development can be delayed and perhaps controlled by suppressing nematodes by preplant fumigation if planting in a contaminated site. Use virus and nematode resistant rootstock. Stouffer, R.F. and Uyemoto, J.K. 1976. Association of tomato ringspot virus with apple necrosis virus and decline. Acta Horticulturae 67:203-208.